Something for the Weekend....IF you have an iPad! 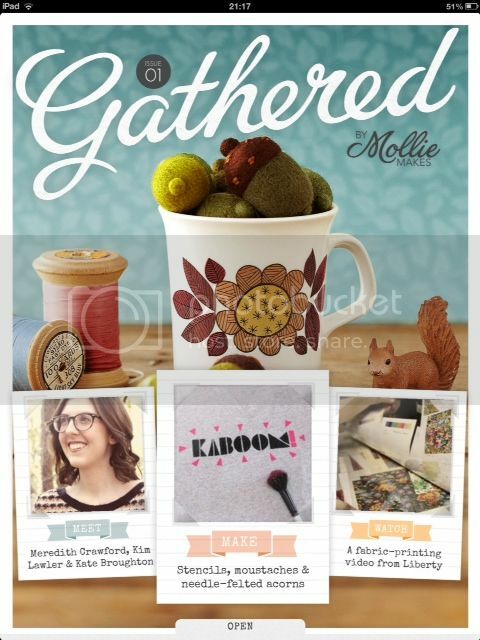 I know there are a lot of Mollie Makes readers amongst you, so in case you missed the news, I thought I'd tell you about Gathered. It's a new weekly Digital Magazine from the people who make MM and at the moment, is available exclusively for iPad download. The first 5 issues are free if you sign up for a subscription - you can unsubscribe if you don't like it, and provided it's before the the first payment is taken, you won't pay a thing, after that it's £2.99 a month. With this in mind, I downloaded issue 1 as soon as I spotted it. Here are my initial thoughts. Pros: Having tried a few iPad versions of different print magazines I have generally been disappointed but as this is designed specifically the iPad, it works EXACTLY how I wanted it to. There are videos, links take you directly to the related websites, you can click to buy things you see, and there is a lot of satisfying swipey action. The project templates can be easily printed out. The iPad 3 retina display screen makes the pictures pop and the clean fresh design look fabulous. I am sure the content will appeal to MM readers. The projects would fit in either magazine and the style and format are very similar, but this has a cleaner and more simple layout. Cons: It's not a problem for me, but I'm sure that those of you who have any other brand of tablet will see the iPad exclusivity as a downside, but I can fully understand the commercial reasons for this (you can read about it here). As an "Apple Fanboy" my gripes are that I don't have a £9.99p/m premium subscription to Spotify so I couldn't stream the soundtrack that had been put together to listen to while reading the magazine (but what a fab idea) and it doesn't seem possible to download the freebie iPad wallpaper without connecting to iTunes. This is an oversight in my mind - I never connect to iTunes as everything on the iPad is now designed to be done wirelessly. (Please, Gathered team, make it possible to save the next one to the camera roll, without needing iTunes). Overview: It took no time at all to go through the entire magazine including all the videos. 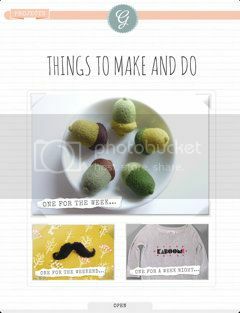 There are four sections: Favourite Things, People, Projects and Gifts. When you take out the cover, contact, credits, coming soon, subscription, and wallpaper freebie pages, there are just 12 pages of content. It left me wanting more, which I suppose is a very good thing for Gathered, although I'm not sure whether £1.49 a week for 12 pages would be considered good value when there are so many great craft blogs I can read for free. For now it's too soon to tell, so I look forward to reading the next 4 issues and will report back on it then. What an brilliant review. I'm not convinced by digital magazines as yet. I love reading blogs and find them so inspiring. I think that digital magazines will be amazing when they are truly digital. This on has made a good start - it is not just a paper magazine on an iPad, it really is an iPad magazine - and I think that makes all the difference. Of course, a magazine, even a weekly one, lacks many of the benefits of a blog. The posts are not spontaneous but planned, there are commercial considerations, and numerous advertisers and all sorts of other people to please (there were no adverts in this issue by the way). Most of the craft and lifestyle blogs I read have none/less of these constraints and I think that's why blogs will always be my favourite.